Jaya's Devil's Chocolate Cake has become my one stop chocolate cake stop! I used to order them from Mala Bindra before but a few disappointing incidences left me glad I decided to shop around. Yes I have known to be a chocolate cake infidel. *Whoops* . 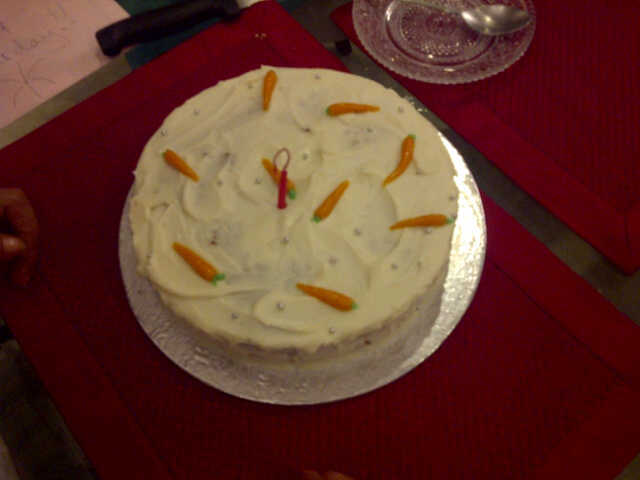 Carrot Cake - Recently tried Jaya's carrot cake w/ cream-cheese frosting and it is delicious!! The cake is moist, nutty, spicy and the cream cheese smoothly finishes it all off with the right amount of subdued sweetness! Despite the unfortunate picture it looks adorable too with all the cute little marzipan carrots. Love it! So far this is all I have tried but will keep you posted ... Meanwhile do not even think twice if you are looking for a deviliciously good chocolate cake... order from Jaya's CakeWalk. Mmmmm! I have also heard great things about her Chocolate Chip Cookies. Definitely next on the list. She operates from her house. So By Order Only. But the best part is it just has to be 2-3 days in advance. The first cake I actually ordered the morning of the day I needed it and it worked out.